At MET we have been constantly engaged in conducting multi-dimensional research projects, not only in the conventional subject disciplines of management but also in the socio-economic and commercial areas of business both within our country and on a global scale. Some of these have found their way in our journal Metaphor by way of papers and workshops conducted by our faculty at MET and other locations of the country. 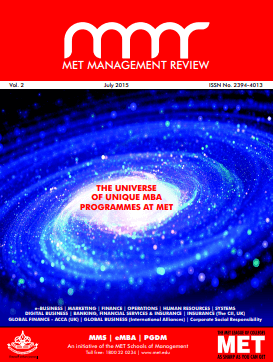 However, with increasing number of research articles prepared by our faculty and students, launched formal research journal “MET Management Review” (MMR), which is bi-annually magazine (ISSN no. 2394-4013) both for publishing in-house research papers as well as inviting contributions from other experts. MMR welcomes original papers from both academics and practitioners on management. Papers based on theoretical/empirical research and experience should satisfy good quality research and must reflect the practical applicability/policy implications of the research. MMR’s articles/research papers will cover a wide range of topics that are relevant to different industries, management functions and geographic locations. The ideas should be presented after careful analysis, through study and readers should be able to translate them into actions to be tested in the real world of business.